A common misunderstanding amongst even experienced manufacturers and users of infrared temperature measurement equipment is that the accuracy of temperature measurement is solely a specification of the infrared device. This statement is correct only in the laboratory under controlled conditions with blackbody (emissivity = 1.0, reflectivity = 0) targets. In the real world, designs and specifications that are applicable in the laboratory can be misleading and sometimes outright incorrect. Following is a summary of the key points of accuracy in a comparison between the IRt/c and conventional IR (detailed mathematical development is presented in Tech Note #89). 1. Real-world materials have emissivity < 1, and therefore have reflectivity > 0, which causes errors from varying background temperatures. 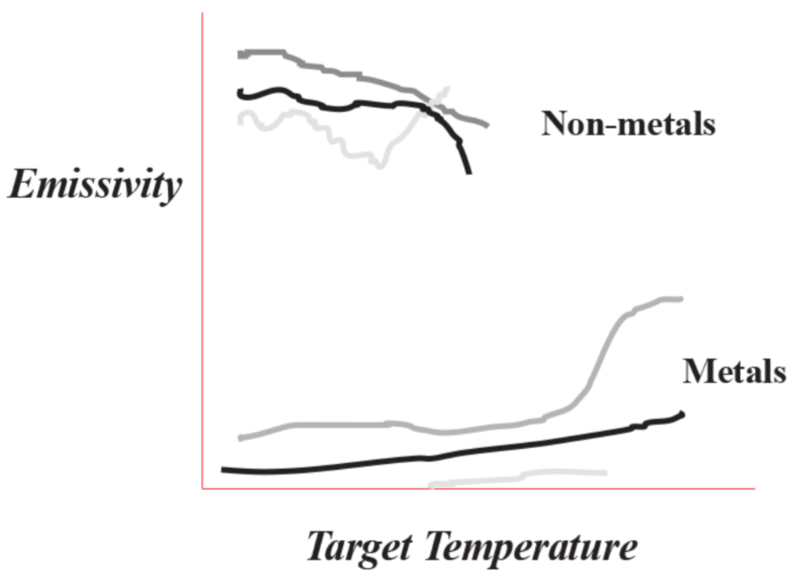 Even non-metals, with emissivity approximately 0.9 and reflectivity approximately 0.1, must reflect about 10% of the energy incident from the background ambient. 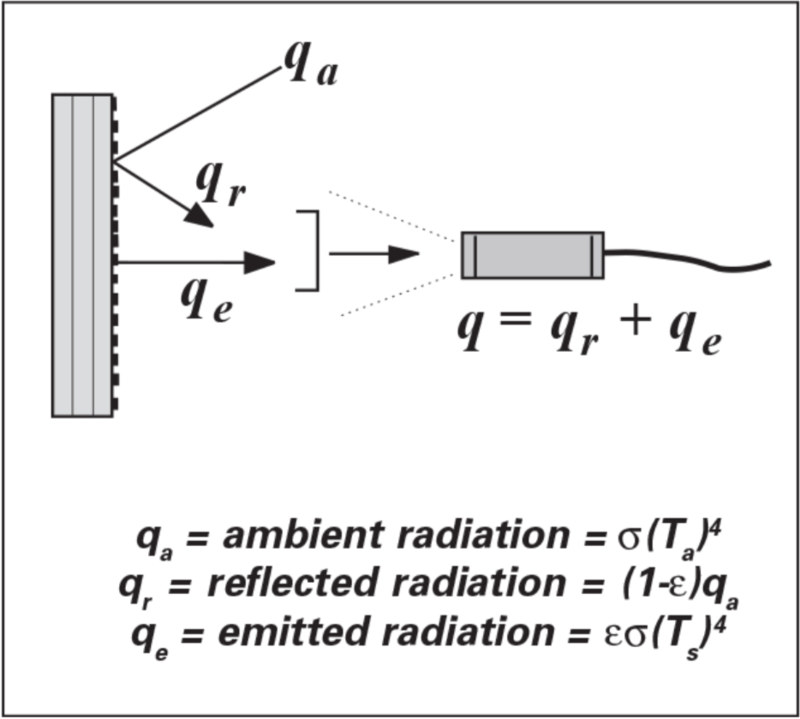 This reflected energy, unrelated to the target temperature, is nevertheless measured by the infrared sensor, and therefore will introduce significant errors if the ambient temperature changes, as it does in the real world. Conventional IR devices, calibrated with blackbodies, usually ignore this effect, and thus are subject to the error. IRt/c’s are specifically designed and tested to include a correction for this effect and thus improves their real-world accuracy. 2. Real-world materials have emissivities that change significantly with temperature, which causes significant errors even with perfect calibration and linearization. IRt/c’s are specifically designed and tested to maintain very high accuracy over a limited temperature range, and specifically not specified to imply accuracy over a wide target temperature range. For this reason IRt/c’s are offered in a variety of temperature range selections, each of which is optimized for a specific limited temperature range, which correctly reflects the realworld material characteristics, and maximizes the accuracy. 3. Real-world temperature control is most accurate if the IR sensor is designed, built, calibrated, and tested at factory conditions that are designed to reflect actual field conditions. Conventional IR devices are designed, built, and tested to standards traditionally defined by blackbodies, which do not include the errors caused by reflected energy and emissivity variations of realworld materials. IRt/c’s are designed, built, and tested to standards that include elevated and variable ambient background temperatures, and real-world target materials that change emissivity with temperature, thus maximizing the accuracy of temperature measurement and control. Thermal Radiation Heat Transfer. R Siegel and JR Howell, ed., second edition, Hemisphere Publishing Corporation 1981.